This site contains several ways of organizing a comparison of the sacraments. For one, it provides an overview of how they evolved throughout the Protestant Reformation, and where major rifts occurred. Then it provides a breakdown by sacrament of how Catholic and major branches of Protestantism diverge from each other. Finally, it goes into detail on the reasoning and development of each denomination’s use of the sacraments, as well as how that fits into their aesthetics. You may find the Catholic explanation here, and the Protestant explanation here. It aims to use visual and multimedia methods to emphasize these distinctions. Divergence in the sacraments occurred because of differing views of salvation. how did the reformation start? This project operates within the context of a course discussing the effects of the Protestant Reformation, particularly in sixteenth century England and Scotland. The project specifically focuses on England. Nowadays in Christianity, there is Catholicism, which in many ways still operates similarly to pre-Reformation Christianity, especially in terms of the sacraments. Catholicism largely functions as one denomination because of its members’ belief in the authority of the Pope to determine how Catholicism will operate. There is also Protestantism, which contains many different denominations: Lutherism, Calvinism, Episcopalianism, etc,. For the purpose of this assignment, aside from details which require individual distinctions, Protestants will be lumped together largely as one population. The summary following is taken from class notes, and simplified for the purpose of basic understanding for those with no experience with Christianity or the Reformation. Back when Christianity mostly indicated Catholicism, the Church had authority over believers, and belief was widespread in Europe. Although they’d dealt with heretics like the Lollards, these heretics weren’t threats to the structure of the Catholic Church yet. For one, the death rate was high thanks to disasters like the Black Death from 1345-1352, and the dangers of childbirth. War and civil unrest flourished in Scotland and Ireland, as well as a plethora of “simple accidents” like drowning, plague, and illness. Catholic belief in assisting souls in purgatory after death put an onus on believers to participate in the Church, and the idea of a “covenant of works” meant that you could get to heaven by participating in sacraments and reflecting godly ideals. This covenant was broken by original sin — when Adam and Eve ate from the Tree of the Knowledge of Good and Evil in the Garden of Eden — and thus everyone on Earth must attempt to atone for original sin. Certain sacraments — such as baptism — help to cleanse the soul of the stain of original sin. The clergy helped assist in these works, and there were several sacraments intended exclusively for the clergy to use or provide for their congregations. There was genuine popular engagement in religion during this period. The Protestant Reformation is considered by many to have started when Martin Luther critiqued the Catholic church through his Ninety-Five Theses, in 1517. He believed that Scripture was the sole authority, and that Christ’s death fully satisfied the penalty of original sin. Salvation could be achieved through grace and faith alone. Propaganda and printing were particularly effective in diffusing this message, and the Church started to feel more threatened. For example, Pope Leo X’s “Exsurge Domine” speech reflected anxiety about the decreasing authority of the clergy. He claimed that there must be heresies to test the faithful. pope leo x, “exsurge domine: condemning the errors of martin luther (1520)” papal encyclicals online, accessed december 8, 2018, http://www.papalencyclicals.net/Leo10/l10exdom.htm. The Reformation began primarily because certain regimes began to consider these new revelations, both for religious and for political reasons. For example, the minimization of the Pope’s authority was advantageous to Henry VIII. The Protestant Reformation ultimately flourished where states allowed it to, and failed where they did not. As Peter Marshall argues, relations between states, and between rulers and subjects, became more ideological than they had been before the Reformation. peter marshall, “the reformation: A very short introduction” (oxford: oxford university press, 2009), 61. Once rulers began to utilize the rift between Protestant and Catholics — whether they identified as the former or the latter — changes began to ripple throughout society, and cultures began to shift. 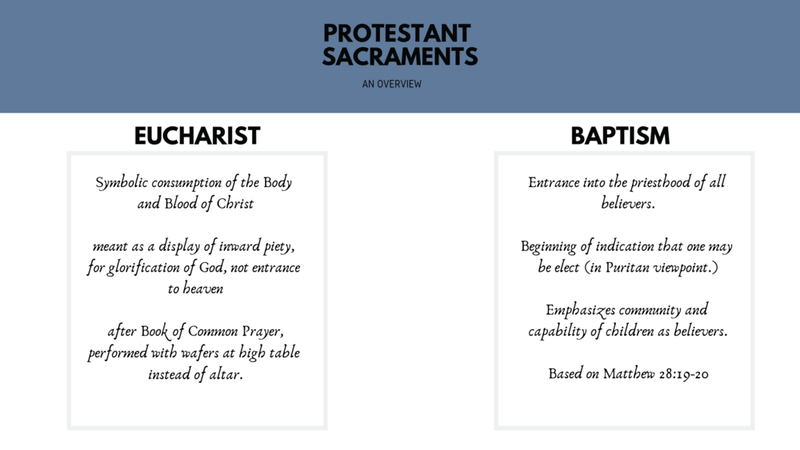 The definition of what constitutes a sacrament varies dependent on whether one is viewing it through the lens of the Catholic or Protestant church. This is dependent on their function within worship. A sacrament was an action or ritual performed for a spiritual purpose. For Catholics, sacraments exist for the purpose of glorifying God, but most importantly for the purpose of getting into heaven. They have seven sacraments, which they divide into three categories: initiation, healing, and service. Protestants believed in justification by faith, not by works, which fundamentally changed the nature of their sacraments. Instead of performing sacraments for the purpose of getting into heaven, they viewed spiritual practices such as these as a display of their inner piety. Especially when the Book of Common Prayer standardized many rituals or iconoclasm became particularly intense, their sacraments tended to be stripped down more than their Catholic counterpoints. As certain scholars maintained, worship was necessary for the expression of inner faith, but was worthless once it exceeded that necessity. For Protestants, sacraments exist for the purpose of making communion with God visible. Sometimes internal prayer is insufficient for glorifying God. In essence, worship must serve godliness and is functional until which point it surpasses that. WILLIAM A. DYRNESS, REFORMED THEOLOGY AND VISUAL CULTURE: THE PROTESTANT IMAGINATION FROM CALVIN TO EDWARDS. (CAMBRIDGE: CAMBRIDGE UNIVERSITY PRESS, 2004), 56.
the sacraments mattered because of the fight for salvation. For catholics, works were required for admittance to heaven. if a person was not partaking in the sacraments, they were not saved. catholics believed that the verse above required this participation of believers. protestants rejected the catholic authority to administer sacraments because of the priesthood of all believers.